Wkly Brief – Should We or I Lead? Driving in a half-listening state, I heard a report that male leaders who use words like “we” or “us” are perceived as weak, whereas a man’s who uses “I” or “me” is considered a strong leader. Women leaders who used words like “I” or “me” are perceived as being bossy, yet they are thought to be team-players when they use the inclusive pronouns. Although I find the gender inequities intriguing, I am more interested in finding out which words, regardless of gender, reflect positive leadership. Having learned that the use of We-Us-Our pronouns is the path of the enlightened, and that ducktape should cover our mouths before we say I-Me-My, we now need empirical evidence to support (or debunk) this theory. To that end, let us consider several influential historical speeches, and determine whether these were I-Me-My or We-Us-Our speeches. This is where words and statistics collide, courtesy of Daryl Kinsman’s Word Frequency Calculator. Let’s start with Dr Martin Luther King Jr’s I Have A Dream speech (Washington, 1963), which uses 1,599 words and lasted 17 minutes. Dr. King used 21 I-Me-My pronouns (1.2% of all words used) and We-Us-Our pronouns were used 51 times (3.2%). * I believe that would count as 20 too many narcissistic pronouns. Then there is President Abraham Lincoln’s Gettysburg Address (1863), who in his 264 word speech, used no I-Me-My words, but included We-Us-Our words 13 times (4.9%). President Lincoln gets an A+ for inclusiveness. President John F. Kennedy’s Inaugaural Address (Washington, 1961), uses eight I-Me-My words (0.6%) and 38 We-Us-Our words (2.8%) in his 1,345 word speech. 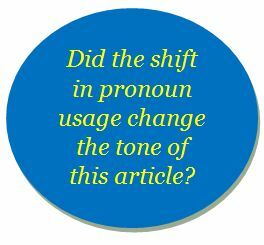 According to our research, that’s seven I-Me-My pronouns too many. I also found two speakers that did not seem to understand the importance of the We-Us-Our pronouns. One speaker overused I-Me-My pronouns, and the other completely neglected the We-Us-Our pronouns. In 1588, Queen Elizabeth addressed the troops as they prepared to face the Spanish Armada. She used 311 eloquent words, of which 31 (18.3%) fell in the I-Me-My category, and only 6 (3.6%) in the We-Us-Our group. And then there is Jesus of Nazareth’s Beatitutes (Matthew 5:1-12). In 158 words, there is one mention of the word “me” and no “we”, yet this beautiful passage brings hope to lost souls and inspires us to be better people. My conclusion: both sets of pronouns bring power to leadership speeches. I-Me-My brings accountability and personal responsibility; We-Us-Our promotes teamwork and inclusion. The key is knowing when to use each style. This entry was posted in Leadership, Weekly Brief and tagged Abraham Lincoln, John F Kennedy, Leadership, Martin Luther King, Pronouns, Queen Elizabeth. Bookmark the permalink.